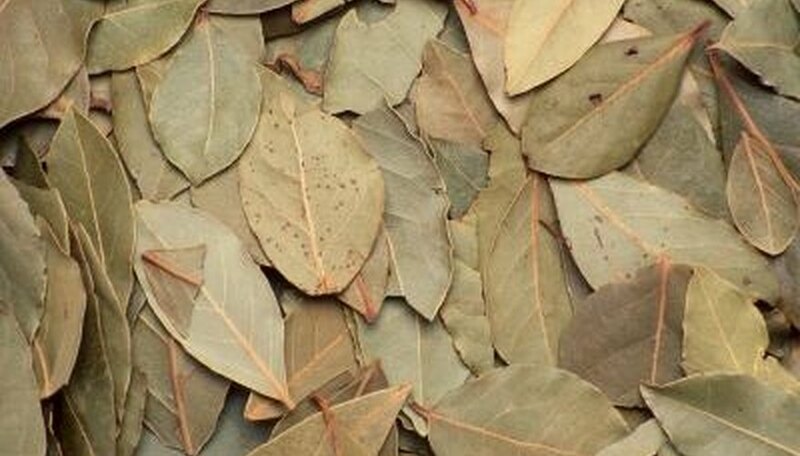 In ancient times, bay leaves, also called laurel, were given to victors, winners and celebrants, giving rise to the phrase "winning your laurels." Bay leaves are added to soups, stews and meat dishes to add a savory flavor with hints of menthol. These leaves are available in both fresh and dried forms and are removed from the dish before serving. Using an excess of bay leaves in cooking or biting into one can result in a very bitter taste in your mouth. If you cannot find bay leaves, there are other herbs to replicate the flavor of the leaves in a dish. Thyme shares similar menthol overtones in its flavor to bay leaves. To replace 1 whole bay leaf, use 1/4 tsp. thyme. Substitute an equal amount of fresh thyme for an equal amount of fresh bay leaves. If the recipe calls for dried bay leaves, use the same amount of dried thyme. Dried herbs will be stronger than fresh in the same volume. Double the amount of dried bay leaves required to determine the amount of fresh thyme to use as a substitute. To add a gin flavor to meat dishes or to replace the bay leaves in a tied combination of whole herbs, called a bouquet garni, use juniper berries. Each 1/4 tsp. of juniper berries will replace 1/4 tsp. of crumbled dried bay leaves or one whole leaf in a recipe. Crush the berries before adding them to release their flavor if you are using them in a rub, but the juniper berries can be left whole for adding to soups and stews. The long cooking of these will release the flavor from the berries. Boldo leaves are an ingredient used in Latin cuisine. They have an intense, woody aroma, reminiscent of bay leaves. Look for them in Latino markets with the dried herbs. Replace bay leaves with an equal amount of boldo leaves. For instance, if your recipe requires one whole bay leaf to be added to the cooking liquid, use one whole boldo leaf instead. The swamp redbay tree is an evergreen broadleaf tree resembling the laurel tree from which bay leaves used for cooking are harvested. Residents along the Atlantic coast of the southern United States replace each bay leaf in a recipe with a leaf from the redbay tree. These trees have elongated leaves with pointed tips and smooth edges. Only use the leaves from trees that have not been treated with pesticides, and wash the leaves thoroughly before adding to your cooking. Do Bay Laurel Trees Make a Mess?